9:15 am-10:00 am Plenary session: Sports Related Head Injuries and Concussions Dr Marc-André Doucet, Emergency physician, Bathurst and President-elect NBCFP Caraquet Cultural Center-Theater * English w translation Accreditation 0,75M1 For more details on the program, learning objectives, conflict of interest and commercial support, please consult/ Pour plus de détails sur le programme, les objectifs d’apprentissage, les conflits d’intérêt et le support commercial, veuillez consulter Friday April 5th 2013 REGISTRATION FEE and FORMS PRE-CONFERENCE 9:00 am-11:30 pm Mainpro-C Workshop: LEAP (GI Problems in Palliative Care) Dr Julie Langlois, Family physician, Bathurst Caraquet Cultural Center-Room 303 *English theory w/o translation and bilingual small group discussions Accreditation 2,5MC To register by mail, return this form with your registration fee . Registrations start February 1st, 2013. 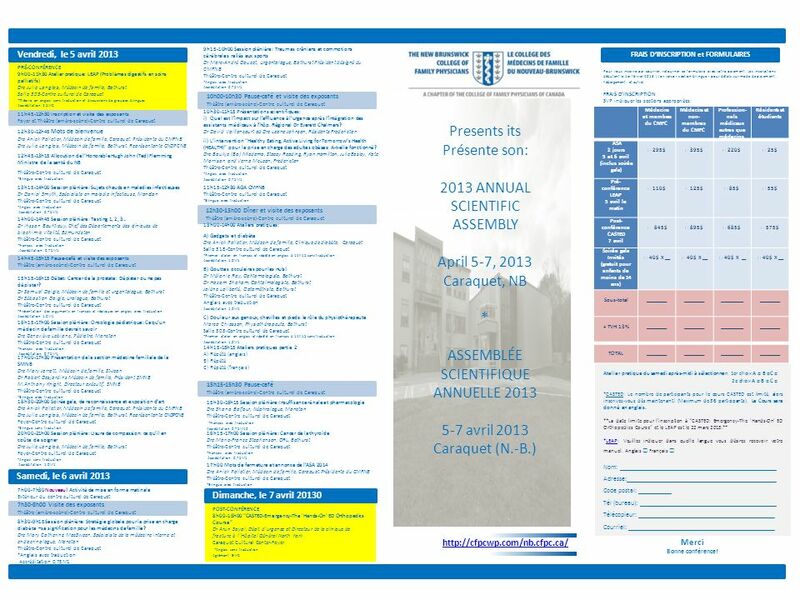 REGISTRATION FEES Please check the appropriate section(s): Planning Committee • Comité organisateur 10:00 am-10:30 am Break and Exhibit Caraquet Cultural Center-Theater (backstage) • Dr (Dre) Anick Pelletier, President/Présidente • Dr (Dre) Roxanne MacKnight, Past President/Présidente sortante • Dr (Dre) Julie Langlois, Education Committee/Comité de l’éducation • Dr (Dre) Cynthia Savoy, Treasurer/Trésorière 10:30 am-11:15 am Scientific Presentations : i) What is the impact of patient flow through the ER Dept. after the integration of physicians assistants at the Dr Everett Chalmers Reg. Hosp? Dr David Vaillancourt ad Dr Leona Johnson, Residents Fredericton II) Healthy eating, active living for tomorrow’s health (HEALTH)-inter- vention for the management of adult obesity: did the intervention work? Dr Baukje (Bo) Miedema, Stacey Reading, Ryan Hamilton, Julie Easley, Kate Morrison and Verna McLean, Fredericton Caraquet Cultural Center-Theater *English w translation Accreditation 0,75M1 Physicians-Members of the CFPC Physicians Non-members of the CFPC Medical profession- als other than physicians Residents and Students ASA 2 days April 5th-6th* (includes banquet) □ 295$ □ 395$ □ 220$ □ 25$ Pre-Conference LEAP April 5th AM □ 110$ □ 125$ □ 85$ □ 55$ Post-Conference CASTED April 7th □ 845$ □ 895$ □ 685$ □ 575$ Banquet for guests (Free for children under 14) □ 40$ X __ □ 40$ X___ Sub-total _________ + HST 13% TOTAL 11:45 am -12:30 pm Registration and Exhibit Caraquet Cultural Center-Foyer and Theater (backstage) 12:30 pm-12:45 pm Welcome & Announcements Dr Anick Pelletier, Family Physician, Caraquet. NBCFP President Dr Julie Langlois, Family Physician, Bathurst. NBNCCPD representative Caraquet Cultural Center-Theater *Bilingual w translation Accreditation • Accréditation 12:45 pm-13:15 pm Address of Honorable Hugh John (Ted) Flemming NB Health Minister This program has been accredited by the College of family Physicians of Canada and the New Brunswick chapter for up to 10 Mainpro-M1 credits. The CASTED Course is accredited for 9 Mainpro-C credits and the LEAP workshop for 2,5 Mainpro-C credits. Ce programme a été accrédité par le Collège des médecins de famille du Canada et la section Néo-Brunswickoise et donne droit à un maximum de 10 crédits Mainpro-M1. Le cours CASTED est accrédité pour 9 crédits Mainpro-C et l’atelier LEAP pour 2,5 crédits Mainpro-C. 1:15 pm-2:00 pm Plenary session: Hot Topics in Infectious Diseases Dr Daniel Smyth, Infectious Diseases Specialist, Moncton Caraquet Cultural Center-Theater *English w translation Accreditation 0,75M1 11:15 am-12:30 pm NBCFP AGM Caraquet Cultural Center-Theater *Bilingual w translation 12:30 pm-1:00 pm Lunch and Exhibit Caraquet Cultural Center-Theater (backstage) 2:00 pm-2:45 pm Plenary session: Testing 1, 2, 3… Dr Ihssan Bouhtiauy, Clinical Head Departments of Biochemistry Vitalité, Edmundston *French w translation Accreditation 0,75M1 1:00 pm-2:00 pm Workshops A) Gadgets in Diabetes Dr Anick Pelletier, Family Physician, Diabetic Clinic, Caraquet Caraquet Cultural Center-Room 318 *First workshop in French Repeated in English at 2 15 pm w/o translation Accreditation 1,0M1 B) Eye Drops for Dummies! Dr Mélanie Roy, Ophthalmologist, Bathurst Dr Hazam Shoham, Ophtalmologist, Bathurst Jolène Laliberté, Optometrist, Bathurst Caraquet Cultural Center-Theater English w translation C) Knee, Ankle and Foot Pain: the Role of the Physiotherapist Marco Chiasson, Physiotherapist, Bathurst Caraquet Cultural Center-Room 303 *First workshop in English Repeated in French at 2 15 pm w/o translation 2:15 pm-3:15 pm Workshops part 2 A) Repeat (English) B) Repeat C) Repeat (French) Hotel Accomodation• Hébergement d’hôtel 2:45 pm-3:15 pm Break and Exhibit Caraquet Cultural Center-Theater (backstage) Pour réserver, veuillez visiter l’Hôtel Super 8 au For reservation, please visit Super 8 Hotel at 3:15 pm-4:15 pm Debate: Prostate Cancer: To Screen or Not to Screen? Dr Samuel Daigle, Family and Emergency Physician, Bathurst Dr Sebastien Daigle, Urologist, Bathurst Caraquet Cultural Center-Theater Accreditation 1,0M1 *Presentation of arguments in French and replies in English w translation General Information • Information générale For information on the Town of Caraquet, please visit Pour de l’information sur la ville de Caraquet, veuillez visiter 4:15 pm-5:00 pm Plenary session: Pediatric Oncology: What a Family Physician Needs to Know Dr Genevieve Leblanc, Paediatrician, Moncton Caraquet Cultural Center-Theater *French w translation Accreditation 0,75M1 Payment and Registration • Paiement et inscription 5:00 pm-5:30 pm Presentation from NBMS-GP section Dr Mary Jarratt, Family Physician, St. John Dr Robert Desjardins Family Physician, NBMS President M.Anthony Knight, Executive Director, NBMS Caraquet Cultural Center-Theater *Bilingual w translation We accept payments by cheque or Paypal® All cheques should be made payable to New Brunswick College of Family Physicians and can be sent to the address below or paid at the ASA Registration Desk. Paypal® payment can securely be made online at Receipts will be given. Nous acceptons les paiements par chèque ou Paypal® Tout chèque devrait être fait au nom du Collège des médecins de famille du Nouveau-Brunswick et peut être envoyé à l’adresse ci-dessous ou à l’acceuil lors de l’ASA. Les paiements par Paypal® peuvent être fait de façon sécuritaire en ligne au Des reçus seront émis. Collège des médecins du NB/College of Family Physicians of NB 950 av. Picot Avenue Bathurst NB E2A 4Z9 t: f: **Please Include registration Form with payment **SVP inclure le formulaire d’inscription avec le paiement NEW! Call for Artwork (paintings, photos, sculptures or others) Are you, your spouse or your child an artist? If so, up to 3 art pieces with the name of the artist and the title of the piece at the conference. We will gladly display them. Nouveau! Appel pour oeuvres d’art (toiles, photos, sculptures ou autres) Êtes-vous ou votre conjoint(e) ou votre enfant un(e) artiste en herbe? Si oui, apportez jusqu’à 3 oeuvres à la conférence avec le nom de l’artiste et le titre de la pièce. Il nous fera plaisir de les exposer. Select your Saturday afternoon workshop here: 1st choice A □ B □C □ 2nd choice A □ B □ C □ *CASTED : The number of participants for CASTED is limited, so register now! (Maximum of 36 participants). The Course will be given in English. 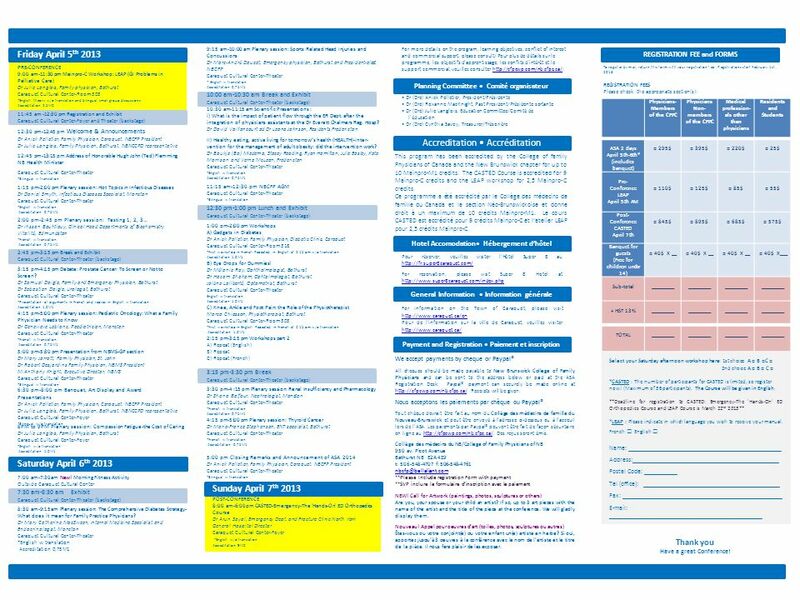 **Deadline for registration to CASTED: Emergency-The 'Hands-On' ED Orthopedics Course and LEAP Course is March 22nd 2013** *LEAP : Please indicate in which language you wish to receive your manual. French □ English □ Name: ______________________________________________ Address:____________________________________________ Postal Code: __________ Tel (office): _________________________________________ Fax: ________________________________________________ ______________________________________________ 3:15 pm-3:30 pm Break Caraquet Cultural Center-Theater (backstage) 6:30 pm-8:00 pm Banquet, Art Display and Award Presentations Dr Anick Pelletier, Family Physician, Caraquet. NBCFP President Dr Julie Langlois, Family Physician, Bathurst. NBNCCPD representative Caraquet Cultural Center-Foyer *Bilingual w/o translation 3:30 pm-4 :15 pm Plenary session: Renal Insufficiency and Pharmacology Dr Shana Balfour, Nephrologist, Moncton Caraquet Cultural Center-Theater *French w translation Accreditation 0,75M1 4:15 pm-5:00 pm Plenary session: Thyroid Cancer Dr Marie-France Stephenson, ENT specialist, Bathurst Caraquet Cultural Center-Theater *French w translation Accreditation 0,75M1 8PM to 9PM Plenary session: Compassion Fatigue-the Cost of Caring Dr Julie Langlois, Family Physician, Bathurst Caraquet Cultural Center-Foyer *English w/o translation Accreditation 1,0M1 5:00 pm Closing Remarks and Announcement of ASA 2014 Dr Anick Pelletier, Family Physician, Caraquet. NBCFP President Caraquet Cultural Center-Theater *Bilingual w translation Saturday April 6th 2013 7:00 am-7:30 am New! Morning Fitness Activity Outside Caraquet Cultural Center Sunday April 7th 2013 7:30 am-8:30 am Exhibit Caraquet Cultural Center-Theater (backstage) POST-CONFERENCE 8:00 am-6:00 pm CASTED-Emergency-The 'Hands-On' ED Orthopedics Course Dr Arun Sayal, Emergency Dept. and Fracture Clinic North York General Hospital Director Caraquet Cultural Center-Foyer *English w/o translation Accreditation 9MC 8:30 am-9:15 am Plenary session: The Comprehensive Diabetes Strategy-What does it mean for Family Practice Physicians? Dr Mary Catherine MacSween, Internal Medicine Specialist and Endocrinologist, Moncton Caraquet Cultural Center-Theater *English w translation Accreditation 0,75M1 Thank you Have a great Conference! Télécharger ppt "Accreditation • Accréditation"
Une production de famille Une visite à Nouvelle-Orléans A visit to New Orleans. A family prodution.